The US is currently head-and-shoulders above all other countries in drone technology but often it is used for dark purposes, the American academic Mark Mason told RT. Earlier this week an Alitalia pilot flying into New York claimed he spotted a drone about 8 kilometers west of JFK airport. Despite the report no US agency has yet come forward to claim ownership sparking fears about who was operating the unmanned aircraft. This comes after Islamabad lodged an official complaint with the US embassy over a drone strike that killed as many as nine people inside Pakistan in February. U.S. officials claimed the attack was falsely attributed to America. The American author and academic Mark Mason commented on issue to RT. RT:How come we don't know who these drones belong to? MM: The US government has the best-kept secret on the planet. They are operating a drone program as we know outside the US. 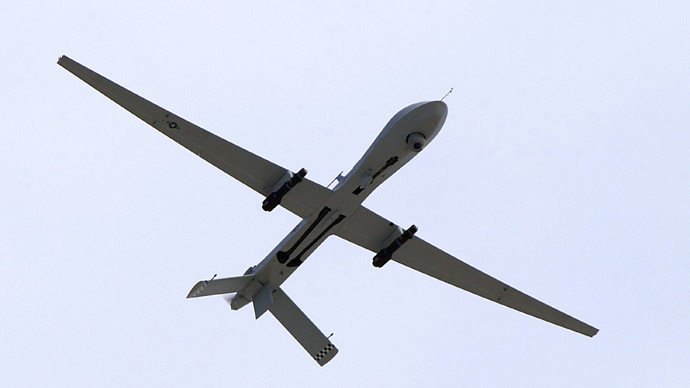 They do also operate surveillance drones – they are under operation now in the US on the force surveillance purposes. There are police departments and other policing agencies, who can apply for permits to use drones for surveillance purposes. RT:How likely is it that the US would test drones off its Eastern seaboard and so close to one of the world's busiest airports? MM: That remains to be seen. The report was made, at this point the information is not available as to was it a model airplane, or was it a surveillance drone? It was reported to be relatively small – 3 to 6 feet. What we do know, that these drone are now available not just for governments but to individuals and that they are diversifying in terms of their cheapness and size. The US Air Force has already announced it is going to be making drones the size of an insect that can assassinate people. The technology is here. RT:Would it be possible if so called rogue states got their hands on such technology? MM: Well, they are already in the hands of rogue states. According to US media the country is the primary purveyor of drone terrorism on the planet right now. The President of the US has a private army. That private army is called the CIA and they participate and conduct kidnappings, tortures and assassinations – all of this, which is totally illegal in terms of international law. RT:Turning to Pakistan, Washington has not confirmed the drones involved in that attack are theirs. Which other powers could operate such aircraft in that region? MM: Given the circumstances it’s unlikely. The US government and the CIA are likely to be lying. We have concrete evidence that the US and Yemeni governments were lying with respect to drone attacks in Yemen – I mean the concrete cable evidence from Wikileaks, where Yemen was claiming they were killing civilians in their own country and it was actually the US drone attacks.